** His mom is a Classic Rose Grey, 3/4 Peruvian & 1/2 Accoyo. ** He's been Get of Sire Winner @ GWAS 2 years running for 2011 and 2012! ** A presence that must be seen to be appreciated - he loves the ladies and is a gentle efficient breeder. Peak-A-Boo tended to peak out from under her Mom when she was nursing – she did not want to miss a thing that might be going on in the pasture. 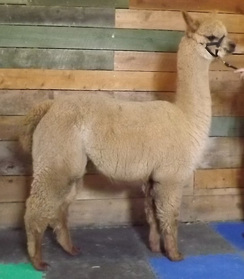 Peak A Boo is a white female with a fine long fleece and a soft handle. Peak A Boo’s dam is our Golden Zoe and her sire is JFS El Tomar (Jefferson Farms breeding program has a reputation for exceptional fleece). No wonder she is such a nice little girl with potential to hold her fineness into maturity. And just to make sure we did not forget to mention it - Peak A Boo is conformationally correct. Peak-A-Boo's 2016 El NIno's Golden Legend cria is here. We named her "Party Girl" because she is so friendly and into everything. Party Girl has a medium fawn fleece. 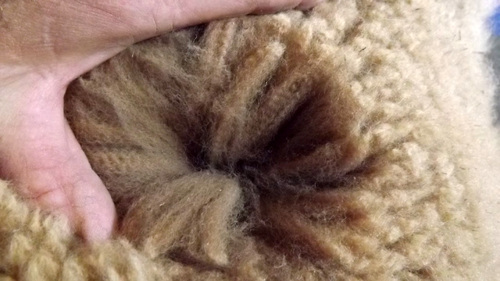 PrairieMoon's Party Girl Legend is a non-fading medium fawn with a fine, uniform, high frequency spider-web crimp, very dense fleece with tight bundles and a soft handle. Party girl has a pretty feminine head. Party Girl was named for her playful nature and leadership in mischief making with the boys as a cria. Party Girl has a sturdy square well balanced frame made for easy birthing. Party Girl's sire is El Nino's Golden Legend and it shows in her good looks and confident bearing and easy temperament. Party Girl comes from a long line of dams with good Mothering skills (4 generations on our farm) easy breeders, good birthers, plenty of rich milk for cria weight gain and health. Party Girl is ready to be bred to your male in spring 2018. 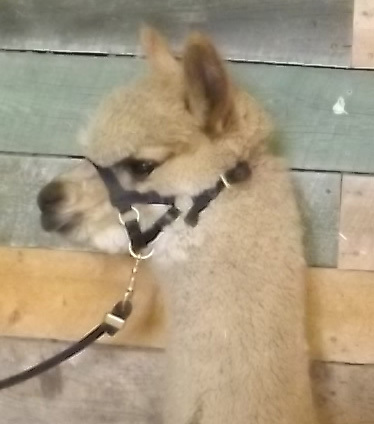 3rd place at Fall Fest 2017 Walking Fleece in a class of 8 (Sara Jane Maclennan commented that she " really liked this female a lot"
as well as cash discounts and package discounts. Prices are for cash purchases.